Yes. I just used figs and goat cheese in a nursery rhyme. And yes. My kids think I am fun and silly for singing that out loud. And yes. My husband thinks I am a total dork for doing so. Side with my kids or my husband….it does not matter. My feelings will not be hurt. I am proud to say that I think figs and goat cheese are a perfect pairing. I seek them out together on menus. I make fig jam so that I can come up with my own concoctions combining the two. In fact, I have recently perfected a gluten-free bruschetta with fig jam, goat cheese, prosciutto, and a slight drizzle of honey. So when I see a recipe for any of these ingredients together, I feel compelled to work some magic with this mysterious fruit. Therefore, when Nancy, of The Sensitive Pantry, posted her recipe for Honeyed Figs with Roasted Rosemary and Goat Cheese, my figgy radar went off and I knew I had to make these. I had already adopted her for this month’s installment of Adopt a Gluten Free Blogger. This event was started by Sea, of Book of Yum, and is being hosted this month by someone who holds a special place in my heart – Shirley, of gfe-Gluten Free Easily. I already knew I was going to be whipping up Nancy’s cinnamon-sugar Doughnut Muffins (Gluten-Free and Vegan). 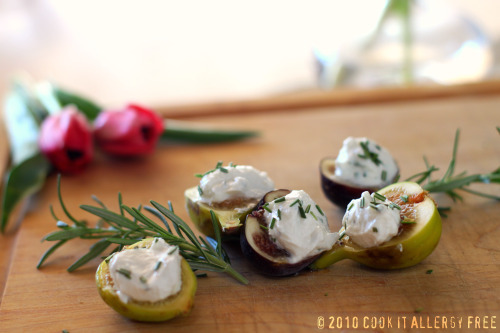 But, since my favorite idea of a meal is a bunch of little appetizers finished off by a scrumptious dessert, I figured these beautiful bundles of figs and goat cheese would fit the “starter” bill perfectly. I was absolutely right. But, no surprise there, right honey? These are unbelievable. I am officially adapting my much asked for bruschetta recipe to include some of the steps from Nancy’s recipe. These are unbelievably simple to put together. But they will impress. Yes. They will impress, for sure. The magic in these is the lemon and honey drizzle that you pour over the figs right before placing them on the grill. The caramelization that results…. simply heavenly. Then top them off with some goat cheese chevre that has been mixed with roasted rosemary and roasted garlic. Holy cow (or better yet, “Holy Goat”)! Just perfect. So..clever Nancy went straight home and put her gluten-free and vegan prowess to work. She came up with this amazing replica. They are gluten-free, dairy-free, and egg-free (however, if you do not have to worry about eggs or milk, she gives you the right measurements of each of those to add to the recipe instead of the alternative ingredients). This recipe is so easy and quick. It also gave me the perfect opportunity to use my new fun Pretty Pansy Cupcake/Muffin pan. However, in a house of all boys (including the dog), nothing, I repeat, nothing, should be called “Pretty Pansy” (except for me, of course). So, this pan has been bequeathed a new title by the males in my household: “Polyglot Plastihead Pan” (apparently this is some sort of Star Wars slang). Fancy pan, or not, these babies are darn tootin’ good! They taste exactly like a cake doughnut. My kids were literally clamoring at my feet for more. My husband ate one, gave a muffled “Oh my goodness! !” then immediately reached for two more. They are moist, cake-like, and decadent. They practically melt in your mouth. And really, how could they not? As soon as they come out of the oven, while still hot, you dip them in melted butter (or melted Vegan Earth Balance) and then roll them in cinnamon and sugar. Nancy hit this one out of the park. I dare you to stop at one. That, my friends, is my challenge to you today. Wowee! Two for one. I am so thrilled you chose those two recipes and hit them out of the park! I love the idea of wrapping the figs in proscuitto–figs, proscuitto? What’s not to love. Thanks a million for adopting me and The Sensitive Pantry. I am truly grateful for and humbled by your post. You are a total dork, but your food photography has taken a leap and I suspect I know why. Can you say Penny de los Santos? And anyone who looks like Courtney Cox’s younger sister can sing any thing she wants to. Even nursery rhymes about figs and goat cheese. Wendy! LOL! I figured you gals would call me out on being a dork! I am the queen in my house of making up new words to every nursery rhyme I know to go along with whatever I am doing at the moment. So, this was just a regular moment in the kitchen for me. And, for the record, it actually drives my husband TOTALLY nuts. He is, in no way whatsoever, amused by my songs. In fact, I really hope he does NOT read this post, for fear he will be totally embarrassed by me. I’ve had figs wrapped in prosciutto; that simple appetizer converted me to be a fig lover! I’m serious! And, those doughnut muffins? Now doughnut muffins! Oh, how my guys would love those!! Thanks for hosting! You have had quite an awesome turnout! And regarding what I said about you, i really mean it, and you are welcome. Now, I know what to do with my figs I just got from the CSA. I was wondering. They look and sound yummy. I can’t wait. Fabulous post. You know, I am a huge (original) Star Wars fan, and I have no idea what a polyglot plastihead is. I’ll have to ask my husband on that one. And, speaking of husbands, at least mine gives me that amused half smile when I do things like sing nursery rhymes. But, we only have one boy, so he has only been surrounded by estrogen for the last 10 years. (girl cats.) I think he needs time to catch up on the testosterone that you are surrounded by. Oh, and fabulous pictures. I love the collages of three. Very artistic. Super post … my mom is figgy lady. 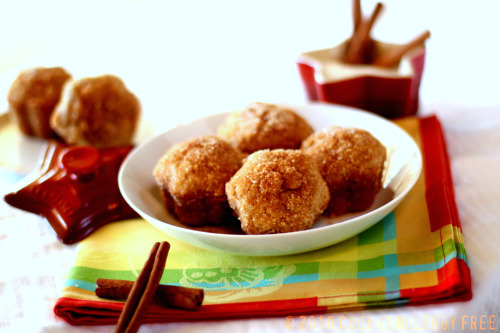 I shall branch out and try these little fig poppers when she comes to visit next week. Nancy’s muffins WERE great, and I stress the “were” part because like your boys, mine gobbled these down in one day! Thanks, Lex! Not even sure how I got so hooked on figs, really. My mom is also a figgy lady, so it probably stemmed from her! Hope your mom likes them! Have fun with her while she is visiting. My Mom comes on Thursday this week, too, to celebrate Conner’s 6th birthday! We will both be getting our momma fixes this week! Yay! Been thinking about you a lot this last week with everything you’ve had going on! I think I’ve only had a fig once in my life…probably about time I try them again and this looks like the perfect recipe!